A large high in the Tasman Sea is approaching the country. This is forecast to bring light southerly winds for most of the North Island on Saturday. Wellington is forecast to have light westerlies early on Saturday. In the South Island there will be light south to southwesterly winds on Saturday. These winds will be stronger further south as a front passes up the island. On Sunday there will be light southerlies over the whole country. The wind may swing to the southeast on Sunday morning around Taranaki as the high moves onto the country. This is good news for those fishing in north Taranaki, particularly Mokau. Don't forget to send us your pictures. We could get light to moderate easterlies over the North Island early next week. This is great news for those that have been waiting so long to get out on the west coast. The drought looks like it is about to break. Fishing on the beach is starting to hot up down here. It is looking particularly good for kite fishing with the arrival of the equinox winds. The Met Office has advised we are likely to have these gusty westerly winds through to Christmas. We have had some good catches over the last week. Merv Goland was out last week and put out one set of 11 hooks for ten big gurnard and one kahawai, 100% success! Murray Kinred came down from Taupo and stayed a couple of nights in our motel. He fished on Saturday and caught a bag full of gurnard. Murray found us on Paul's Fishing Kites website. He was so pleased with the fishing he has booked in to come back in November when he should load up on our big snapper. Some of our locals have been getting very large kina off the point at the southern end of the bay. So you dont have to go far to get yourself a bag of fresh food. We took our Big Dropper Rig to Waihi Beach in the middle of September. Campers couldn't believe that we were catching so much fish when they were lucky to get one or two fish while spending a whole day fishing from their boats. We spent four days fishing and were very pleased to catch 30 fish. For two days the wind was blowing from the west so we set the rig out with 10 hooks. We only put out one set per day as this gave us more than enough fish to eat. When the wind changed to the northwest we sent out the torpedo. Rigged with 16 hooks we managed to catch six snapper and twelve gurnard over two days. We were using salted bonito for bait as we have found this works very well. We didn't catch any undersized snapper and our biggest would have been about 3kg. The gurnard were average to large in size. This will be our last report for about five or six weeks . We do enjoy reading the reports from other kitefishers. I was fishing at Tokerau on Tuesday with my Big Dropper Rig. There was a moderate westerly blowing and the sea was calm. Using mullet for bait I put out one set of 20 hooks. Fishing a couple of hundred metres north of Urlich Road I set about 700 metres offshore between 1815 hrs and 1900 hrs. I caught four snapper and they were all about 1.5kg each. Kitefishing in the far north is getting better all the time. Tenga from Kaitaia Air & Tackle reports one of the locals bought a Nighthawk Kite from his shop recently. On his first trip out with his new kite he caught 18 fish, 17 of these were snapper. This is good news for those of us living further south, it shouldn't be long before the snapper are off our beaches. Judy from Oakura Bait & Tackle reported last week there was an algal bloom off the beach at Oakura. The water is a red colour and is easily spotted. There have been a lot of sharks in the area recently. Snapper fishing around Whangarei is going well. Stephen from Stirling Sports has been out again in his kayak. He recently caught three snapper over 10lb and quite a few others weighing between five and ten pounds. Stephen reports there is plenty of whitebait around and this should mean good numbers of kahawai in the same vicinity. There have been no reports from the west coast due to the prevailing westerlies we have had lately. Stephen has been trying out the Target Snapper Hooks and will be reporting the results on his radio programme on Saturday mornings on 1ZB, 1026AM. The snapper fishing has been patchy off Mangawhai but it didn't stop Brian from Mangawhai Tackle catching an 8 pounder from the beach at Mangawhai Heads. Brian reports he has also recently weighed in a 7kg snapper caught from a rubber boat not far off the beach for one of his customers. This weekend looks like a great weekend to head to Mangawhai for a kitefishing trip. Fishing has been patchy around Auckland. The big male snapper are getting ready to spawn so the females shouldn't be too far away. Drifting baits down the current seems to be the most successful method for catching these snapper. The good news is the trevally are back in the Manukau. We haven't caught any big ones yet, but they cant be far away. The fish are still fairly skinny but will obviously fatten up over the next few weeks. The trevally bites are variable, the fish are either smashing into your baits or very tentative. Shellfish baits are still the best for the trevally. There are still some very good size gurnard in the harbour as well. Paul from Matarangi Hire & Hardware reported a 26lb snapper caught last week out off Whitianga. The angler, Frank, was using Target Snapper Hooks and was very impressed with his catch and the Target Snapper Hooks. This is exciting news for anyone heading to the Coromandel for a fish this weekend. Well, this is the first report from Japan on my first kite fishing trip. I was so excited the night before my first trip, I could barely sleep. Anyway, we got to the beach which takes three hours to get to. We told a friend we would get some small shrimp for them so we had to wait till noon to try kite fishing. We finally got to the place to try it out and to make a long story short there was no wind. I was so disappointed. So was my son. You should have seen my wife and I trying to get the kite up. 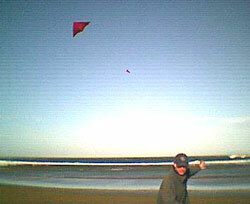 Sometimes there was a burst of wind that got the kite up about five metres but that didn't last long. We did some surf fishing while waiting for the wind but it never came. We waited till it got dark then gave up and went home. It was very depressing. It was like having a piece of candy in front of you but not being able to eat it and then have to leave it. Well, I don't know if that was much of a report but that's all I have for now. Anyway, we will try next week or the following and keep you posted. I cant wait to send in my first picture. Fishing at the Kaipara Heads early last year we had the best kite fishing known to man. On one of our most challenging days we had a very light easterly wind, slight seas and an incoming tide. As always at this spot there was one hell of a rip. We used the huge Mega Mouth Kite with a Skyhook to beat the conditions. It worked a treat, so well that at times it was a battle to hold the gear in the 10 to 15 knots gusts. We caught plenty so it was well worth the effort. Over the season me and the mates would do overnight trips with catches of 60 or 70 snapper being the norm for a two day session. We were always within our limit, as I have never had any problems finding people who wanted to be a part of this kitefishing experience.